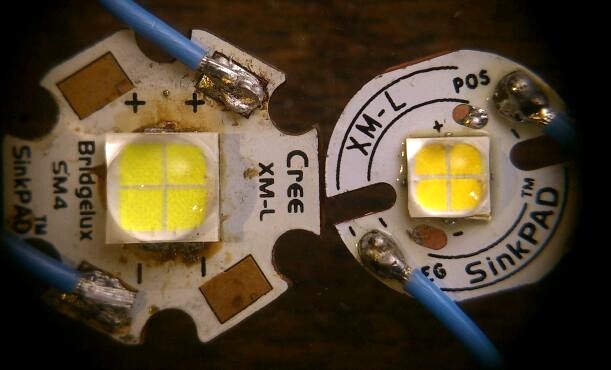 Cree XHP70 up to 4022 Lumens and XHP50 up to 2546 lumens - Multi-die leds. Expected top 28°C, real feel 33°C humidity is eleventy billion, chance of a shower. Currently 22°C, humidity 98% at 6am. I can guarantee Ill be having a shower. Too cold for a beamshot? Can’t be that cold in Texas. It’s only 3 degrees here in Michigan. And I’ll raise you -21 windchill! (-35 yesterday). And I will raise you -29F actual temp. w/ -46 chill factor last Wednesday/Thursday when I was in Lake Placid, N.Y.!!! lol!! ALL those temps. are still verrrrry cold! 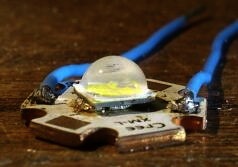 No wonder you’re reporting such high output from these leds. You’re all living in a fridge! I did output tests on a XHP50, and a XHP70 (and an MT-G2 once more, for direct comparison in the same set-up), all on DTP copper boards. The XHP70 was a N2-bin 6500K led from Mouser, the XHP50 was an unknown bin led sample that Hank from intl-outdoor sent me to test (thanks Hank! ), it looks like a neutral tint between 4000 and 5000K. The MT-G2 to compare them to was an M0 bin 4000K on a 16mm MT-Noctigon from intl-outdoor (because that is what I had in house). Here's the three together to show the sizes, note that the MT-G2 is a whole lot bigger, especially compared to the XHP50. Let's start by saying that I do not trust the XHP70 output results below, it was a makeshift fit onto a 20mm XM-Sinkpad and I suspect that the heat path was not optimal and that that shows as a disappointing performance at high currents. 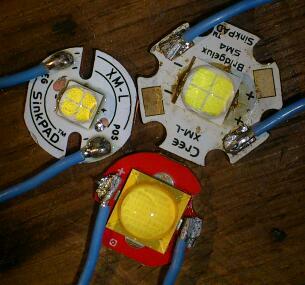 I soldered three copper bits on the pads to widen the distance between the electrical pads to make the led fit. The reflowed result does not look pretty although the solder connections are good, without shorts from the electrical pads to the core. The other two leds were reflowed well onto fitting boards, so I trust that these tests on them give their maximum possible performance. I illuminated the two XHP leds that I tested together with a 3000K XHP50 led from Mouser that I did not test with a 365nm UV-light. You can clearly see that the XHP50 led is a warmer tint than the cool white XHP70. The test set-up is the same as during my XP-L tests, except that I used a different integrating sphere and that the ledmount cooling fan was set at its max of 12V because of the high wattage emitters at test here. This is what I found, and it is interesting! (I see now that the chart title is missing 'egrating sphere' at the end). EDIT: by request of RaceR68 I improved some chart parameters (data are the same). *the voltages of the three leds are comparable at all currents. In a single li-ion situation with single-die white leds, such a 0.3V voltage difference that you see here would be highly significant because the overhead voltage is so critical, but because these leds will usually be driven by two li-ions in series that give way more generous overhead voltage, a 0.3V difference matters less. *this particular MT-G2 led in this test maxes out at 12A, that is an amp higher than in my previous MT-G2 test. It could be the individual led, but it could also be the better and active cooling that the copper ledboard-mount provides, that was not yet made at the time of the first test. *the XHP50 has a max at 9A, lower than the MT-G2. It could be the result of the very different type of die, but more likely is that the small footprint of the led is even with the best possible mounting not enough to dissipate the heat at high currents (~50W of heat at 9A! ); it is heat sag what you see. If you consider the XHP50 as four 2S2P XP-G2 dies (XP-G is about the size of the dies), the maximum current per die could be 6.5A, so because the current in the XH-P50 is shared between two strings of two, a maximum output at 13A is what you could expect if heat sag was less. *the XHP70 is behaving like it has enormous heat problems at higher currents. If it would deserve any reason to exist, the performance should be way better. 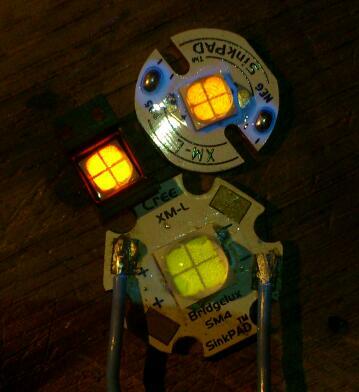 The dies are XM-L size, so if heat was not a problem its maximum could be at over 16A (2x8A for the two strings). So I think my poor mounting is the cause here. Dale has measured an output of the XHP70 out the front of a flashlight build of over 6000 lumen already, so it seems that something is wrong here. If I can lay my hands on a DTP copper MK-R board (Cutter has them, *sigh*) I will redo the XHP70 test to see if it does better then. *all three leds, after the test, were set at a lower current again (the current that gave 80% of the maximum measured light output to be precise) to see how they suffered from the high stress of the test. All three performed similar as before, these are all very tough leds! 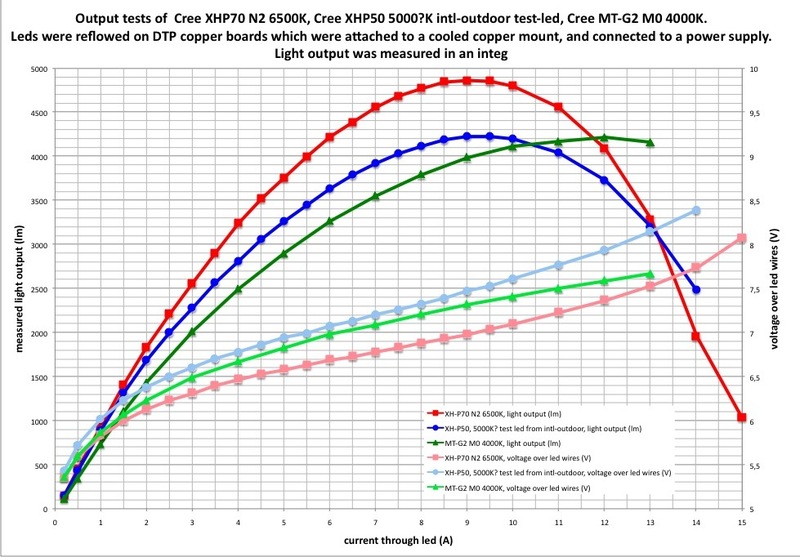 *if I compare the led output at lower current (3A) to the numbers that Cree provides, even though a bin is a range so I can't tell anything definite, it seems like the djozz-lumen is on the high side, for the XH-P70 I measure 4.5% more than Cree, for the MT-G2 I measure 8% more than Cree. I assume here that the leds were kept at 25 degC, which in my set-up, at 3A, I think that will not be far off. So that's my tests sofar. I'm impressed, for now by the XH-P50, and eventually probably by the XHP70 too (as Dale already showed). I tried some reflectors on top of the bare leds, and I find it indeed a pain to make a good beam without donut or other beam disturbances, even with OP-reflectors. But with an OP-reflector and some fiddling with the focus I could make very decent beams that do not look perfect on a white wall, but are really adequate in practical use of a flashlight. Fantastic tests as usual! Even with the XHP70 going a little saggy it’s great to see a direct comparison. Bring on those sinkpads and nicer tints! Great work as usual djozz. In your final point you mention comparing your numbers with Cree’s numbers. Are you looking at the datasheet or the characterization tool? The numbers in the datasheet are are at 85 degC. Seeing that graph gets me excited about the XHP50 as well! When you consider keeping amperage between 3 and 4A, both of these are really performing amazingly well! 3A is attainable by most any cell out there, so an XHP50 should be able to deliver in excess of 1500 lumens even in, say, a chopped MiniMag with 2 14250’s. :bigsmile: Oh yeah Baby! Edit: For the record, the MT-G2 M0 at 4000K makes much less output than a Q0 at 5000K. Much less! Great work as usual djozz. In your final point you mention comparing your numbers with Cree's numbers. Are you looking at the datasheet or the characterization tool? The numbers in the datasheet are are at 85 degC. I used the characterisation tool so that I could set the temperature at 25 degC, with the cooling that my set-up provides, at 3Ax6.5V=20W, I think the junction temperature is way closer to 25 degC than 85degC. I’d be more excited if we had a strong 17mm boost driver. Max output voltage would need to be at least 6.1v, preferably at least 6.5v. Maximum output current could be as low as 1.5A to 2A, but preferably 2.5A to 3A. The XHP50 currently runs approximately double the cost of cheapy MK-R emitters. Once it’s down to approximately 150% of the cost of a cheap, mounted MK-R then I’ll be more interested as a budget MT-G2 replacement. Optics available to get a good beam w/ no donut. Single cell operation w/ existing linear, DD, and buck drivers. Gotcha, thanks for clarifying that. For the record, the MT-G2 M0 at 4000K makes much less output than a Q0 at 5000K. Much less! It was the led that I had at hand, it is what it is. The XH-P50 was again another tint... I think the main message of the test is not the exact outputs, although in any case they are clearly very good, but that there's a good idea about voltages now and (at least for the XH-P50) what the useful drive currents are. Taking cheap shots at poor ol Dale. Y’all should be ashamed. Here I am, trying to help, reading the box and reporting the numbers and I get ridiculed. Guess I can just play with my lights and not tell anyone and let someone else do all the testing, figure it all out. Rivers of liquid nitrogen in Texas, rich, real rich. You’re invited to come lay in the Texas Sun for 3 hours on August 9th, we’ll have a nice long conversation about cooling. Haha yeah I bet! Your ambient summer temp probably isn’t far off the 85deg C temperature that Cree uses to test, perfect conditions! 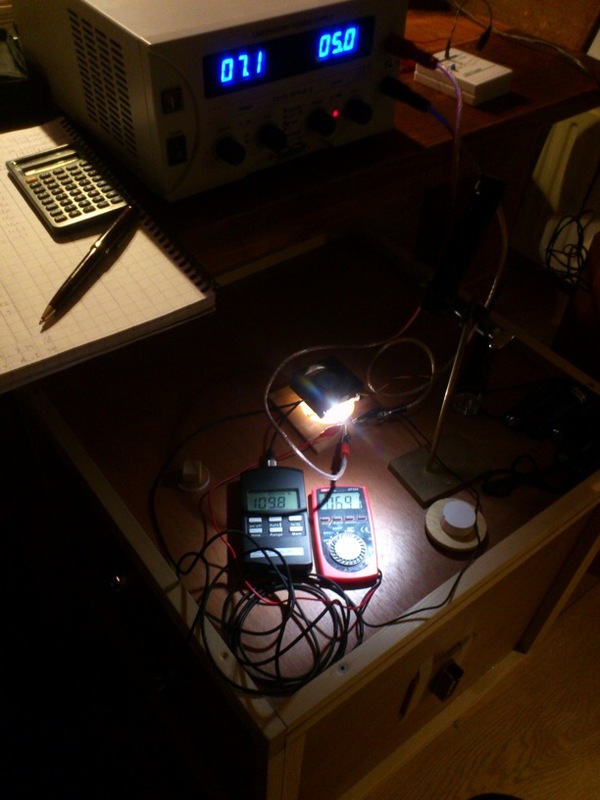 -with a Zener driver, I finally have a use for my 2×18650 solarforce. Having said that, I’m not familiar with the MK-R, maybe I should look into it. I’m not a whitewall hunter, a slight donut is meh. I have a Convoy M1 host here needing to used for something. Hmmm? Do you have a permanently installed tripod for easy light/camera mounting? Awesome to see such varied lights going up against each other, is the JM26 a reflector light or TIR? Interesting tint variation on the hotspot there. The Shadow JM26 is a lot like an HD2010, but with a side e-switch. It has a big 28mm driver that is regulated. But it only made 900 lumens. The hot spot was gorgeous, very well defined, the reflector in it is unusual in that it is more bowl shaped that parabolic, but it’s perfectly made with no blemishes and no visible machining under the shiny mirror finish. I’m surprised that it is able to focus the array die so well, but it really does a nice job. 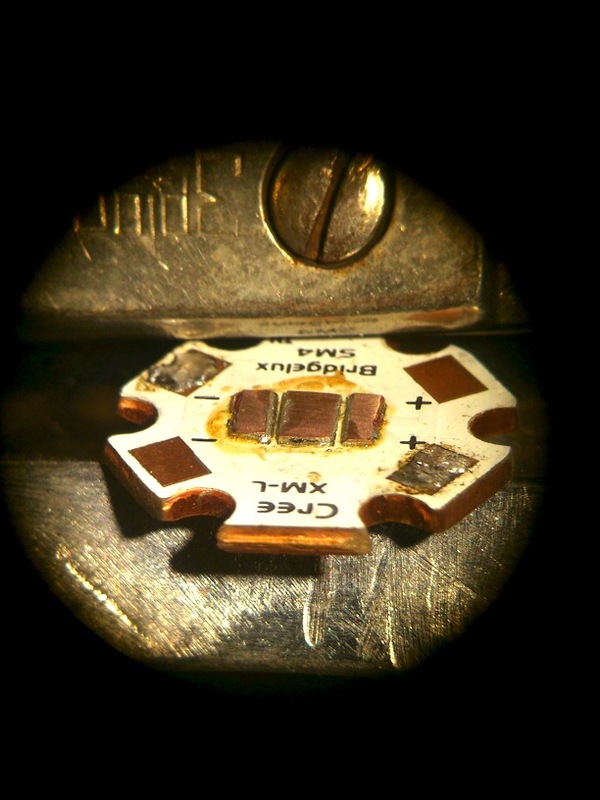 The inside base of the reflector is about 2.5-3mm above the substrate of the die. I take a tripod out to the same place every time. I do a quick leveling on it, then use the vertical line of the house to make sure it’s true. Then I zoom in and lock the adjustable head down with the oil drum in the center of focus. Once that’s done, I set the camera for a 2 second timed exposure, manual focus, infinity focus, 1/2 second exposure at f/5.6 and ISO1600 and take wide angle shot and zoomed in shot (24mm and 112mm), then run back in the house before the cold gets to me. Laughable, I know, but I’ve had an issue with muscle spasms for 15 years that can be triggered by my core temperature falling. Not funny when your body is jacking you around. Bet it looks funny though. I’m surprised that it is able to focus the array die so well, but it really does a nice job. 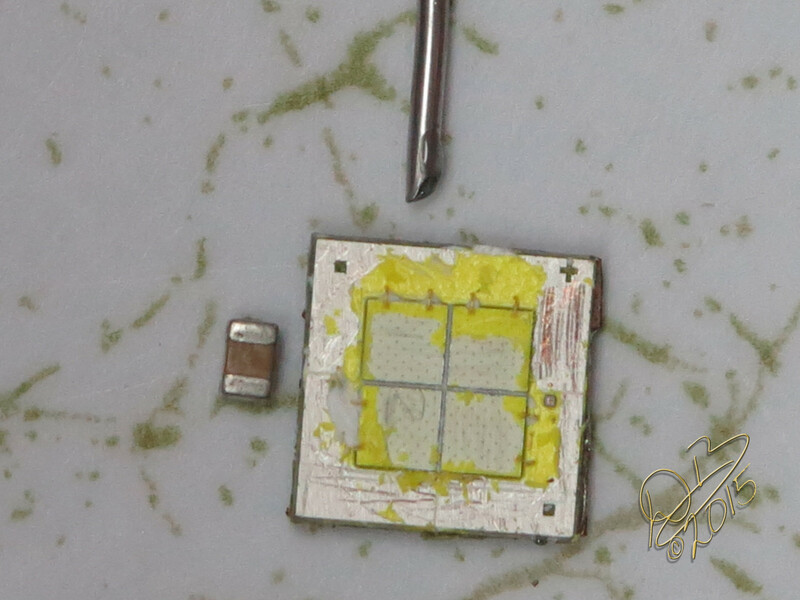 The inside base of the reflector is about 2.5-3mm above the substrate of the die. Ah thanks, yes that sounds like it’s actually a fair bit out of focus perhaps? I think the quad dies really do like this type of setup best, or else the dreaded donut makes an appearance. Of course I’m only joshing about the cold, man I’m the worst when it comes to heading out into the cold to take beam shots. I can always find an excuse to stay inside near a toasty test rig and scribble numbers onto graph paper instead. 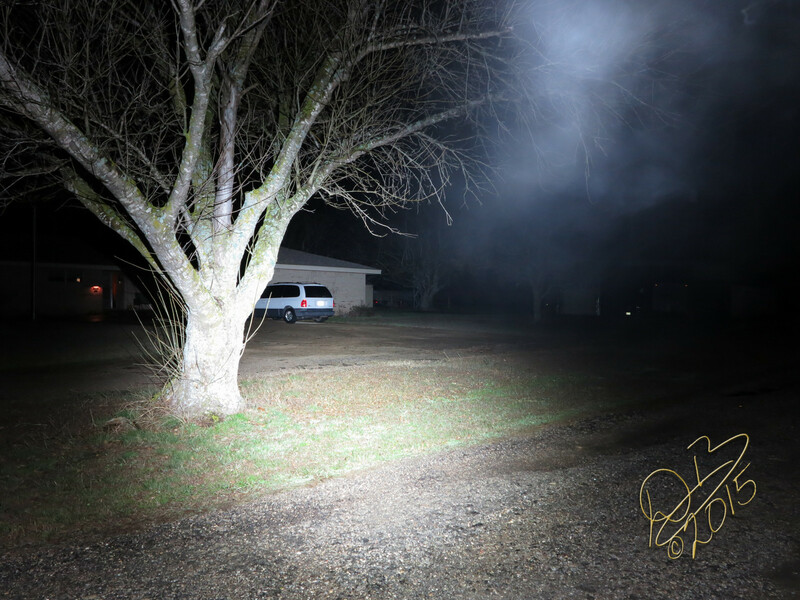 I’m sure we all really appreciate the effort you put into your beamshots and testing, it’s always a really good and varied shakedown of a new emitter. Edit: Looking at the emitter pics of the XHP50 above, compared to the XHP70 it looks like the spacing between the dies is actually rather larger on the smaller emitter. Maybe that’s just an optical illusion because of the differences in the dome but those gaps look rather too large to my liking. I guess once they are dedomed we’ll see just how far appart those dies actually are. Could it be worse than the MK-R? [snip] Edit: Looking at the emitter pics of the XHP50 above, compared to the XHP70 it looks like the spacing between the dies is actually rather larger on the smaller emitter. Maybe that’s just an optical illusion because of the differences in the dome but those gaps look rather too large to my liking. I guess once they are dedomed we’ll see just how far appart those dies actually are. Could it be worse than the MK-R? Oh I see! (I think, heh.) Does the spacing look worse larger on an absolute scale, or a relative one? To me it looks as if the inter-die spacing is the same distance for both emitters. It’s just that one emitter has much larger dies than the other, so the relative spacing appears worse on the smaller emitter. Or at least maybe. Eh? Looking at the bond wires, the gap appears about twice as wide as a bond wire. So it’s really quite small then. The dome is making the die look big, it’s also magnifying the gap between em. We know the bond wires are very thin, so twice the width of a bond wire is what, about .2-.3mm? The solder wire above it is .031” Kester EP256, beside it is a capacitor from C1 of an FET board.